I picked up this beat up pair of faux wooden ski’s at a garage sale a couple of years ago. Then I promptly forgot all about them until I was cleaning out my carriage house the other day. I think they were about one step away from ending up in the burn pile. They aren’t real ski’s, obviously. I’m assuming they were always meant to be decorative in some way. So I decided to see if I could improve them with a little paint. 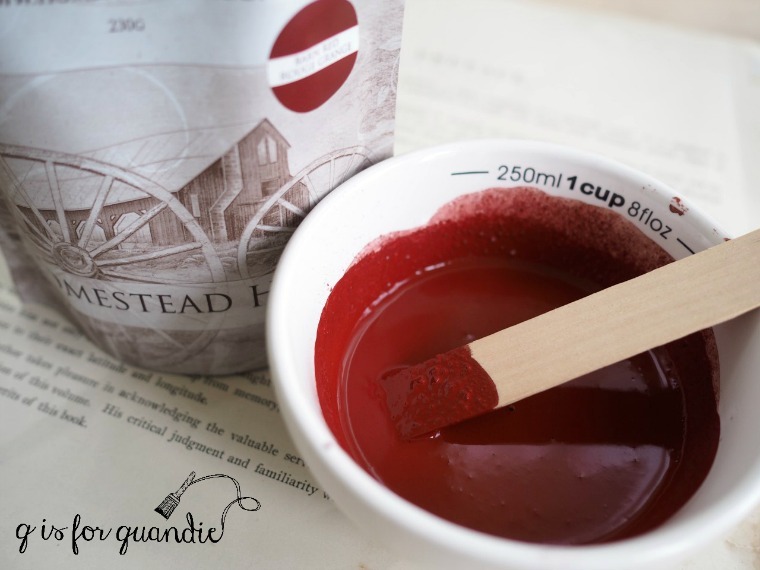 I started by mixing up some Barn Red milk paint that Homestead House sent me a while back. This color is pretty much exactly what you would expect from a barn red. Just a tad darker and more muted than Miss Mustard Seed’s Tricycle. It just took one coat to cover the wood perfectly. Since this was bare wood the paint soaked in and didn’t chip at all. 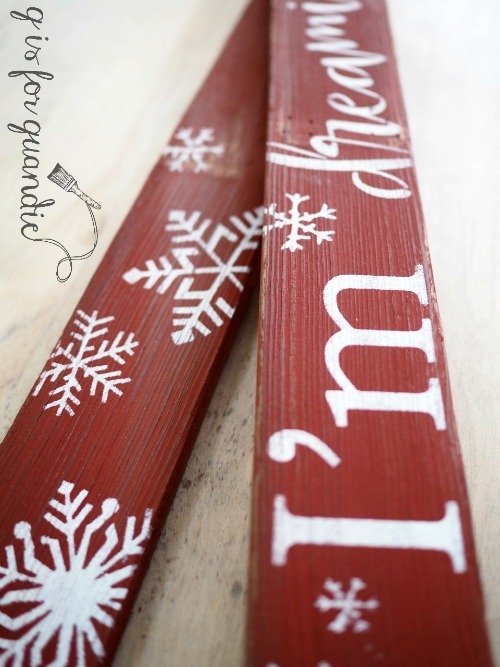 Once dry, I stenciled my Christmas message in a warm white acrylic craft paint. Can I just mention at this point that it’s really challenging to take interesting photos of long skinny items? 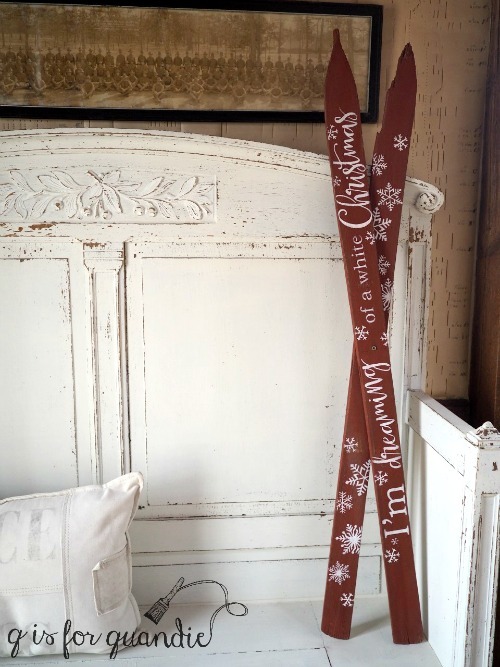 Once the stenciled designs were dry I sanded the ski’s to distress them a bit and then wiped them down with a rag and just a small amount of Miss Mustard Seed furniture wax. 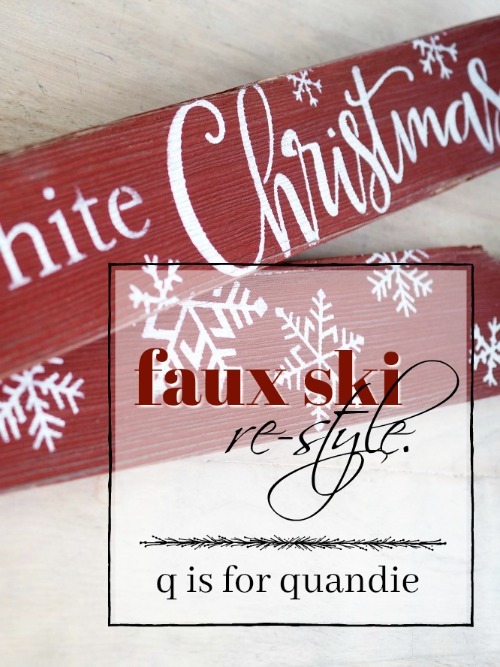 And just like that these ski’s became colorful Christmas decor. I put a hanger on the back so they can be hung on the wall horizontally under one’s banjo, if one happens to have a banjo on the wall. But they also could be just propped up vertically. I worked on a few other little painting projects last weekend, all part of a pile of stuff I’ll be bringing in to Reclaiming Beautiful for their upcoming holiday open house on Thursday. If you’re local, consider heading to Stillwater on Thursday starting at 3 p.m. for a little shopping! Previous coffee is always a good idea. Next around the world in 6 hours. Gorgeous! The color is so vibrant and the stencil was absolutely perfect. What an eye…this was a great save. Reminds me of the saying “one mans trash is another mans treasure” or something like that…lol. 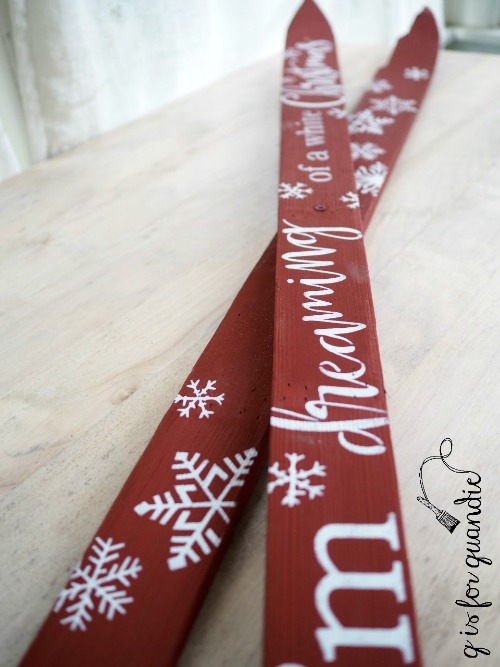 I used two different stencils, one of snowflakes and one with the saying … and I modified the layout a bit to fit it on the skis. It ended up working out perfectly! Love this. Since I live in Texas, snow skis are rarely at sales or thrift stores. But if I find any, I will use this as inspiration! LOL, yes, I suppose snow ski’s would be pretty hard to find in Texas! What a gorgeous red! I guess good things come to those who clean? 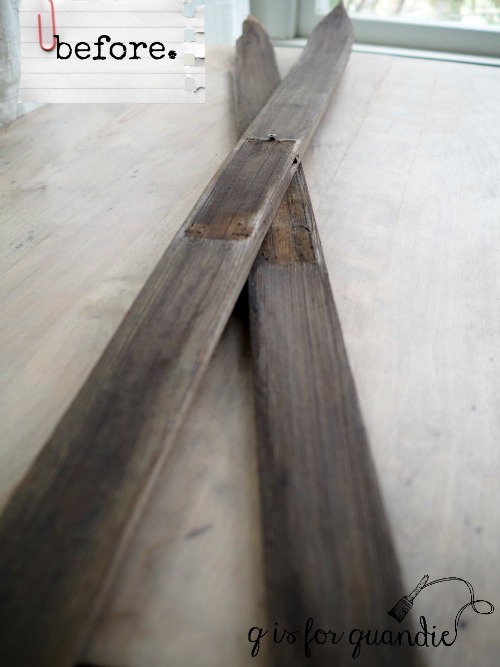 Great repurpose project! These ski’s turned out darling. I am going to have to find me a pair. 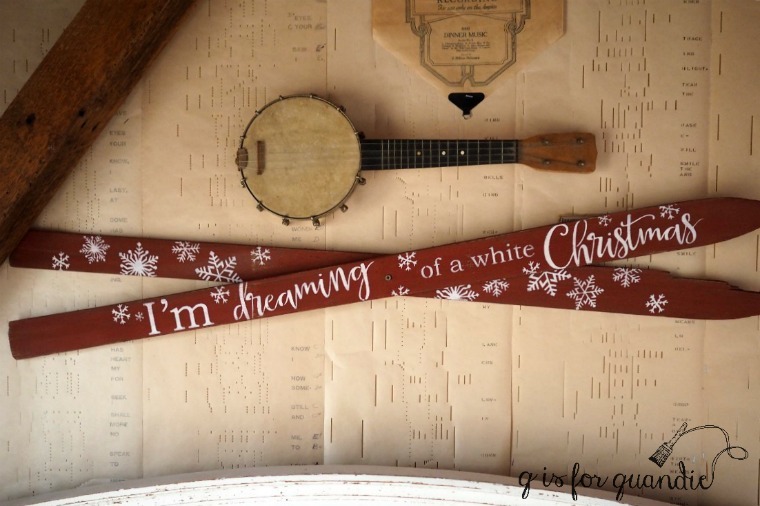 What a fun idea for Christmas! Maybe you can find some at a thrift store! I have two pairs that we got at an estate sale. They are truly real skies! Yours are missing the little wooden piece and the leather straps that held your boots onto the ski. These were all they had before other materials were developed like metal and fiberglass etc. Really? I can’t imagine them being terribly functional. But cool, I like that they are legit ski’s! Awesome! What a great repurpose. The white lettering really stands out with the red. Nice job! They would be adorable propped up by a front door, love that idea Betty! Love, love, love this! So cheery and seasonal! I really like the skis. Thats what i want for Christmas.. Something wintery i can decorate the front if the house with but nothing that needs electricity. A little Curio added to Tricycle (Miss Mustard Seed’s Milk Paint ) should give you a barn red or using antiquing wax over the colour Tricycle. For Fusion Mineral Paint users adding a little Chocolate to Fort York Red will give you this colour. All these products are from Homestead House. Goedele over at Dala Muses just posted a little box that she painted in a mix of Tricycle and Curio, and you’re right the color is very similar to the Homestead House Barn Red. And great idea for mixing it using the Fusion paint as well. I have a door frame that I need to touch up with a barn red and that might be a great way for me to get that color using the Fusion acrylic paint, which I like for high traffic areas because it’s so durable!